CRRTravel.com: What is a Bromeliad? If you have been on a Costa Rica Adventure or you plan on coming chances are you will see many more Bromeliads than you do monkeys. Although chances are you will see quite a few monkeys also so don't worry I know they are a bit more exciting than a bromeliad. But one way to make a bromeliad very exciting to see is to LEARN something about it! So that is today's topic the bromeliad. A bromeliad is actually a member of the pineapple family. The pineapple is one of the few bromeliads that grows on the ground. Most bromeliads grow up in the trees (which makes these type of bromeliads "epiphytes"). One of the most interesting things about bromeliads is that for some just one bromeliad is like a small little planet. A bromeliad is crown-shaped which allows it to hold gallons of water just one small plant about the size of a large house plant. This water along with debris forms a home for many different insects and probably most interesting to us frogs such as the poisonous dart frog tadpoles. The plant itself feeds off the different types of debri and ecosystem that is formed by the instects allowing the plant to stay alive and in exchange be a host for many different creatures. This also means the plant is not parasytic which means it does not rely on the larger tree it is attached to for survival. It is sort of like our planet how the larger trees send off oxigen and the Earth survives. Or on the contrary like us humans who pump CO2 into the atmosphere and the Earth struggles for survival. (Although our human CO2 production is very small to what the forest and oceans produce it throws off the natural cycle.. read more) Just another reason why we should follow natures examples. A very strong fiber can be extracted from the bromeliad. This fiber is known as cabuya and has been used to make rope, baskets, and even hammocks. Another interesting use of the leaf of the bromeliad is for medicinal use. 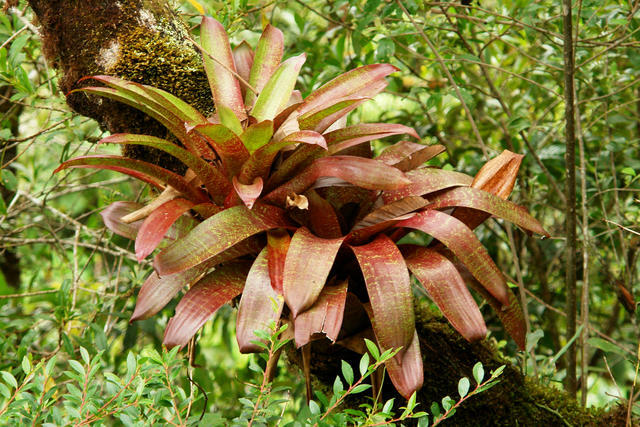 Many natives from areas where you find bromeliads have taken the leaves and pounded them with salt to use on wounds. You will find bromeliads all over Costa Rica and some of the most spectacular places to see the bromeliads are the cloud-forest areas.